Is Supreme Court’s decision, the consent of the governed? 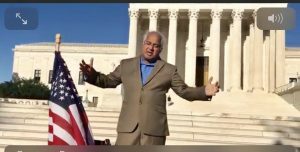 Dr. Mike Ghouse June 27, 2018 Comments Off on Is Supreme Court’s decision, the consent of the governed? 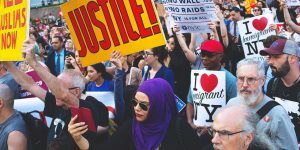 Tuesday, June 26, 2018, Washington, DC –The 5-4 decision by the US Supreme Court today to uphold President Trump’s Muslim ban raises many questions, including vulnerability and mockery of our judicial system. Supreme Court is the last resort for justice, and its decision is final, they uphold the laws of the land as ‘they understand.’ We cannot even appeal to a higher authority; there isn’t one. Unfortunately, we have to live with it, and we cannot even condemn the decision as it will create chaos. Does it mean, we will be compromising with something we do not agree with? No, we have choices to exercise our options, and one of them is an Amendment, and the other one is the process involved in the appointment of Judges. Was Justice compromised for the imaginary security needs of the President? Aren’t the laws made to remove personal discretions and use an equal yardstick to render impartial justice to all? Are all men created equal? Did our founding fathers meant American men, or did they have the universal vision? Should our laws be universal truths or convenience for the selected ones? Is the decision of the Supreme Court made with the consent of the governed? Of course, there are two layers, the elected President nominates the Judges for the Supreme Court, and the elected representatives approve the nomination. Did the majority of the governed consent to this? President Trump is no doubt elected by the electoral majority, an accepted norm. However, did he have the permission of the governed, the majority? He had 46.1% of the Americans support whereas his opponent had 48.2%. Should we not consider runoff elections in the future to have at least 51% of the Votes of the governed? Was the decision anchored in politics, as to who appointed the judges? Shouldn’t our judges be free from politics? Justice Roberts questioned the soundness of Trump’s policy, yet he supported his fellow Republican. The Supreme Court has been wrong before in narrowly interpreting the phrase that, “All men are created equal” to mean White men. Now, the full understanding of the phrase includes Black men, women and the LGBTQ community. We have made progress in many areas, but this decision is compromising the First Amendment, giving discretionary powers to an individual. The nomination of judges depends on the integrity of our elected representatives. They should resist the temptation to slam dunk the nomination because their party is in the majority. Instead, nominations and approvals should require a 2/3rd majority, with an equal number of Republicans and Democrats in the committee, it gives a broad consensus for a position that is a lifetime appointment. It should never be 51/49. Whoever gets the majority in 2018, would they have the sense of justice and fairness to correct these errors? Would their lust for power will keep them from taking the initiative? However, before we elect these rascals, we should we qualify them to be inclusive or exclusive? At the Center for Pluralism, we will make an effort to qualify candidates based on their inclusivity and ability to embrace all Americans regardless of their uniqueness. Dr. Mike Ghouse is committed to building cohesive societies and offers pluralistic solutions on issues of the day. His loyalty is to America and not to the political parties.